I have a confession to make. I am a chocaholic. I tend to believe that my satiable cravings for chocolate is not only inborn but hereditary. I got it from my father’s side of the family. Thank you Aunt Rachel 🙂 Chocolate is also a valued treasure in our household. 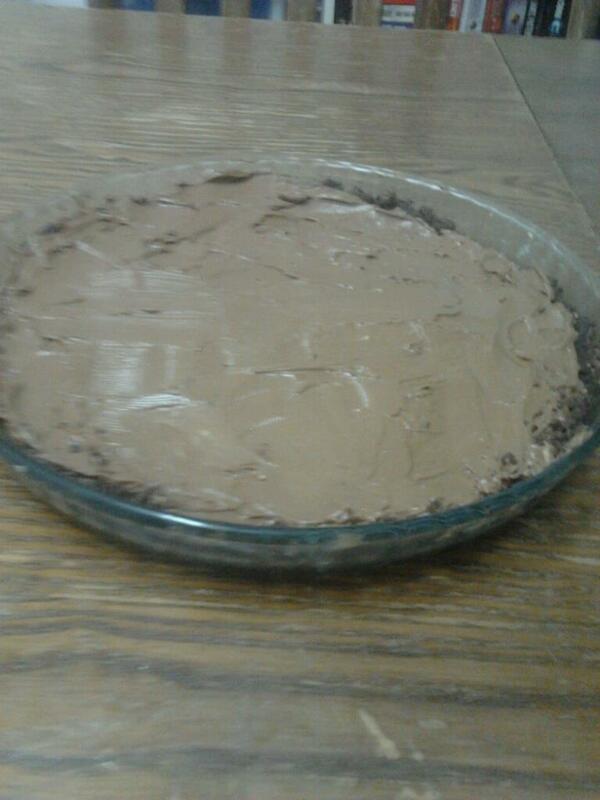 In fact, I would estimate that I incorporate chocolate in my desserts 75% of the time. Studies have shown that dark chocolate has antioxidant compounds that lowers high blood pressure thus reducing the risk of heart disease. 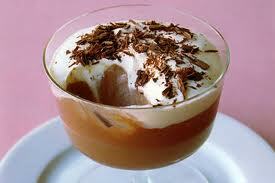 Tip: I include coffee in most of my chocolate desserts. I find it that coffee accentuates the rich flavor in chocolate. In a mixing bowl, whisk cream cheese till fluffy. Add the sugar,coffee,vanilla, and continue beating still smooth. Fold in the melted chocolate and mix till well combined. 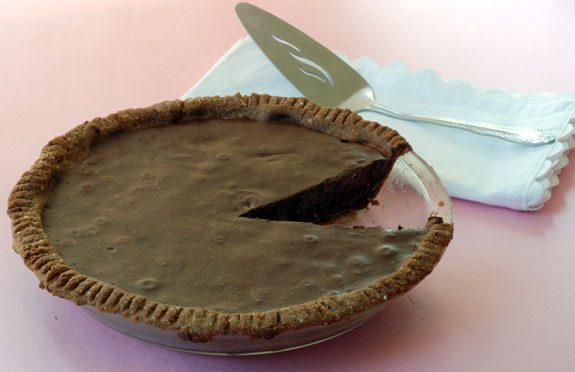 Transfer chocolate cream cheese banner to the pie crust. Cover with plastic wrap and refrigerated for 2 hours to allow the cheese mixture to set. This entry was posted in Dairy, Desserts. Pulse wafers,crackers,or cookies in a food processor until they’ve been reduced to tiny granular particles. Combine pulverized cookies/wafers with sugar and melted margarine.Press ingredients into a 9 inch greased pie pan covering all sides. Bake at 325°F for 10 minutes. 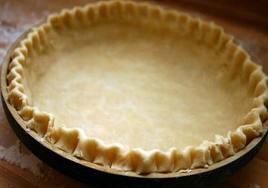 If you decide not to bake, cover pie with plastic wrap and let lit freeze for 45 to an hour until firm. My sister made a special request to have this recipe published on my blog. 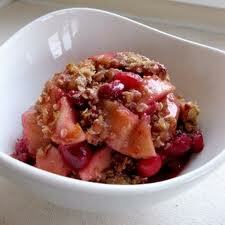 Cranberry apple crisp is on of her all time favorite side dish as it is mine. I usually make this around Thanksgiving time rather than using a can of cranberry sauce. It goes just as great with turkey. Cranberries contain several nutritious benefits such as antioxidant compound that offer protection from tooth cavities and inflammatory diseases. Raw cranberries have moderate levels of vitamin C and dietary fiber. Researchers discovered that unsweetened cranberry juice reduces cholesterol levels as well. Aside from the health benefits, I like the balance of sweet and tartness that both the apples and cranberries give. This dish can be served hot or cold. It can be served as a side dish as well as a dessert. As a dessert, I highly recommend it served piping hot with vanilla ice cream on top ; absolutely crumbliness. I am going to take a more salubrious routine and use fresh/frozen cranberries rather than the canned item. Preheat oven to 375 degrees F (190 degrees C.) Butter an 8 inch square baking dish. In a large bowl, mix together apples, cranberries, brown sugar, cinnamon and nutmeg. Place evenly into baking dish. In the same bowl, combine oats, flour and brown sugar. With a fork, mix in butter until crumbly. Sprinkle over apples. Bake in preheated oven for 40 to 50 minutes, or until topping is golden brown, and apples are tender. 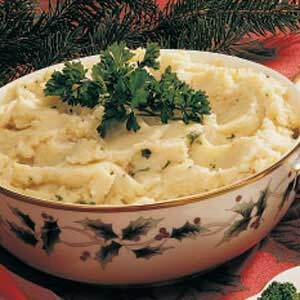 This entry was posted in Desserts, Side Dishes. In a food processor , combine flour and salt. Cut in shortening until it resembles coarse crumbs. Pour ice water into flour all at once and blend. Wrap with plastic and chill in refrigerator for 30 – 45 minutes until firm or freeze for later use. Roll out each pastry disk on a lightly floured surface. Flour your rolling pin to prevent stickiness. Add a little more flour if the disk should start to crack. Roll out the pastry to fit into a 8-9 inch pie pan. Once you’ve achieved your desired size, lightly roll the pastry around your rolling pin and unroll the dough on top of the pie pan. Dust off any excess flour. Gently lay in pan and with a small floured piece of pastry or with your fingertips, lightly press the pastry onto the bottom and up the sides of the pan. Flute the edges of the pastry or use the tines of a fork to seal the pastry. If possible, chill the pie crust before filling and baking. The pastry is now ready to use. Yields 2 9 inch pie crusts. This recipe was originally a spicy chicken nugget recipe that I posted. I figure that most of these schnitzel and nugget recipes are reversible. What works for nuggets shouldn’t be a complete fiasco with schnitzel. What I like most about this recipe is that there is no deep frying involved at all. Its just as crispy,crunchy,flavorful, and juicy. There are not that many steps to it and the prep time is approximately 15 minutes! This dish would go wonderfully alongside with some fresh garden salad. Squeeze a little lime/lemon juice and you are all set. For those of you who are not adoring fans of spice, you can substitute the spicy wing sauce with honey-mustard,BBQ, or even with salad dressing (low fat of course.Remember, we’re trying to incorporate healthy ingredients). I have to enjoy a variety of Ken’s Steak House sauces and dressings. If you can’t find any of his brands then grab anything close enough and use that. When it comes to cooking white meat, one should be careful not to exceed the baking time since white meat is vulnerable to drying out quickly. 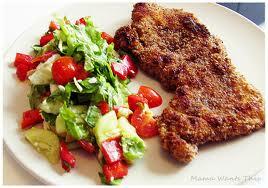 8 thin sliced chicken breasts or schnitzel meat. 1. First, preheat your oven to 375˚. 2. In a shallow bowl, pour bottled Ken’s Spicy Wing Sauce over thin-sliced chicken cutlets. Cover bowl in plastic wrap and let it sit in the fridge for 10 minutes allowing the flavors to absorb. 3. Fill a large zip-lock bag with flour and breadcrumbs and shake till combined . 5. Lay each cutlet out in a lightly greased baking pan. DO NOT overcrowd the pan. 6. Once all the rolls are good to go drizzle a little of the remaining sauce over top. Finish off by spraying the chicken with cooking spray. 8. Bake at 375˚ for about 20 minutes. Serve with salad and enjoy! This entry was posted in Meat.